While on a small trip to Women’s Rights National Historic Park, I couldn’t help myself and had to take a closer look at the church next door, located at 140 fall street, Seneca falls, NY. While poking around I was approached by a woman working in the flower beds, who introduced herself as Allison Stokes, Founding Director of the Institute. She explained that the church caught on fire a number of years ago and suffered less from fire damage and more water damage from firefighters dousing the flames via a hole in the new roof. The church itself was built in 1871 and has all the hallmarks of traditional Tuckpointing. The ribbons are almost all gone except in sheltered areas but interestingly on the façade a distinct cleaner area can be seen. 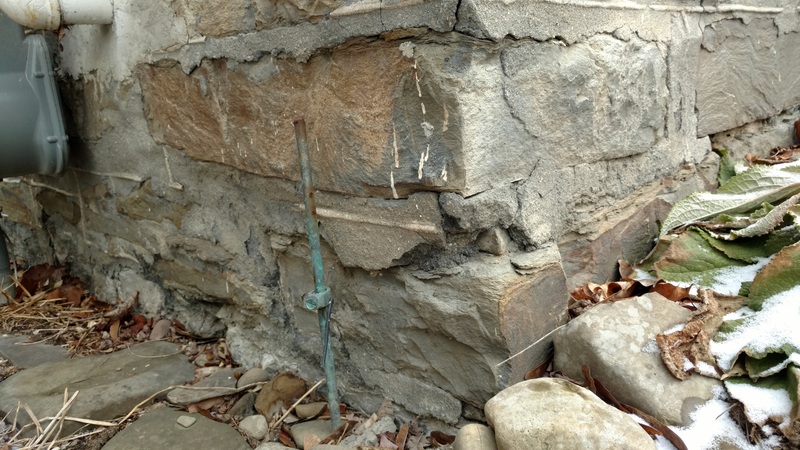 This cleaner area follows a near plumb line on the face of some brick, indicating that the head joints or perp ribbons were laid directly on the face of the brick. Another interesting feature is that a few parts of the stopping mortar are vivid. However, this is only in isolated areas. Further investigation would be needed to determine the exact tuckpointing methods employed here. Never the less it would look excellent restored to its former glory. After seeing some other Tuckpointing in Seneca Falls, NY, I was driving past this interesting church and decided to poke around. The small placard says that the stone tower was added in 1882 but I am not sure if all the stone and brick were added then or not. Either way its safe to say that the Tuckpointing is at least this from 1882. 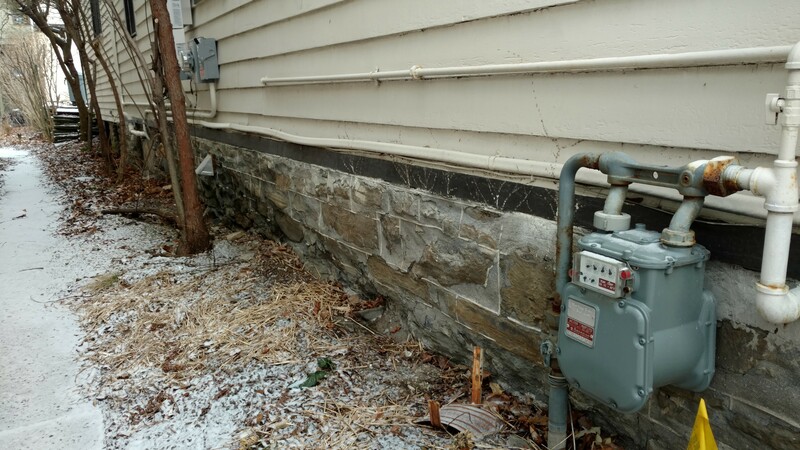 This pictures show the masonry elements that reflect similar architecture with tuckpointing in the area, and would fall in line with tuckpointing on churches in the region. The evidence on this façade is slim. However, it is faintly noticed as a bed joint under some of the corbelled brickwork and only a few inches remain around the doorway. Even when masonry is not the focus of buildings architecture, the necessity of a chimney provides an opportunity for high quality details to be carried out. In this case Tuckpointing was well executed on the brick chimney. While this expression of the masonry craft is a little tarnished, details are still well preserved on under the eaves, where protection from the elements is greatest. Take note that on the face of the chimney with the greatest exposures; the tuckpointing is nearly completely gone, leaving behind only the unifying red colorwash. This gives a muted appearance and an undoubtable suggestion that perhaps the best approach to “fixing” this artwork is to simply paint it red, as was once done in the past to the section above the roof line. 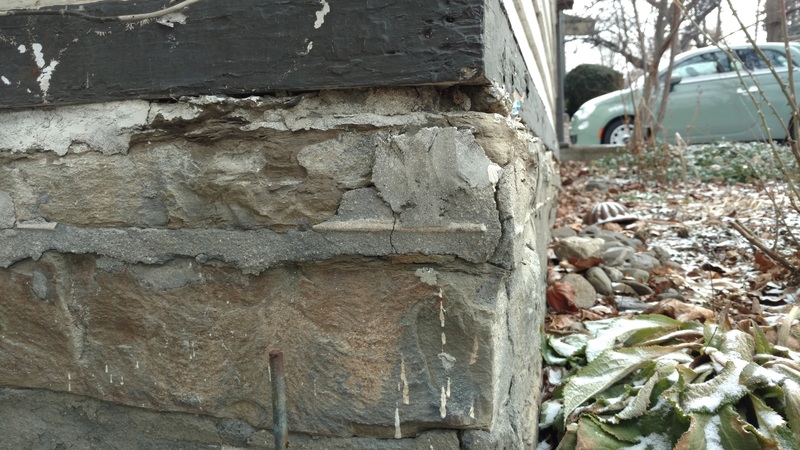 Such practices can accelerate decay by causing excess moisture to be trapped in the masonry units (i.e. Brick) and lead to spalling and of course peeling paint. This is a great example of tuckpointing, in that it was done to what might be relegated today as an unworthy section of the house. Looking at the entire area of exposed stone it’s amazing that the time and effort would have been put into such a small area. 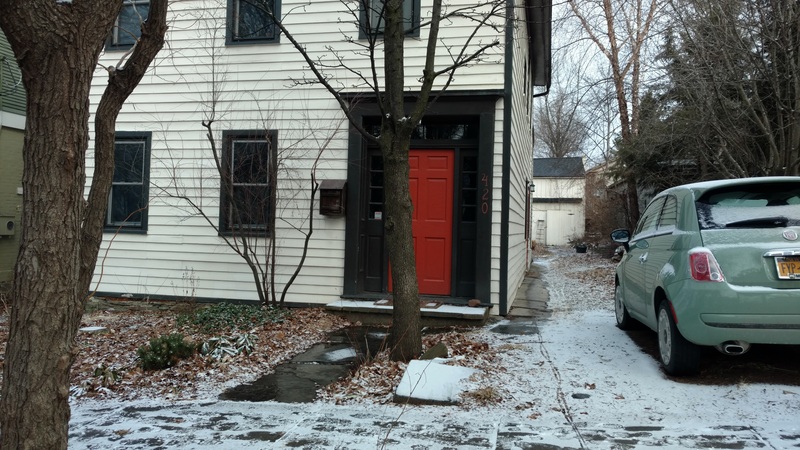 With only a few square feet exposed directly to the street to be seen by pedestrians and much of the surface area exposed to the neighboring house, it exemplifies the perfection sought out by builders and the expectations owners had of craftsmanship. What’s also great about this example is the cross section that can be seen on the exposed and worn corner, showing the beaded joint profile. Now I know I only have one photo of this example but I do plan on going back and writing a part II on this one, so hold to your hats. Until then you can focus on the photo along the roofline above the porch, where a patch exists about 4ft wide and 1.5ft high. Or better yet take a look at this detail for yourself next time you go by. 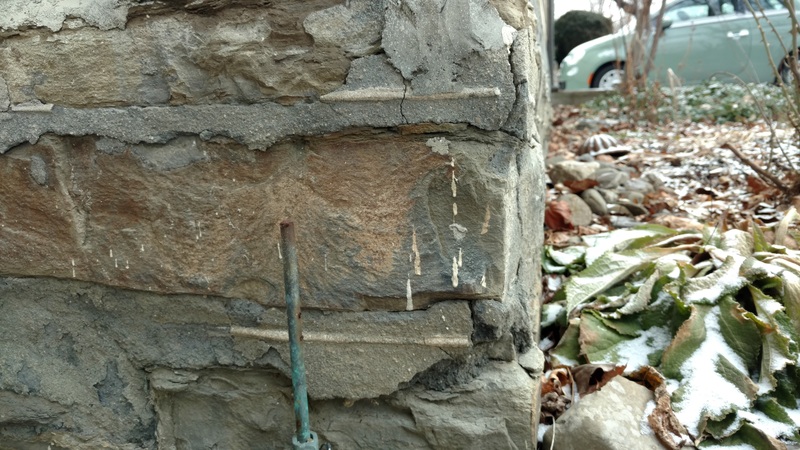 Here is an example of some Tuckpointing done on the stone foundation of an INHS owned building at the corner of N. Plain St. and Seneca St. While it might not obvious at first this work was meant to simulate well cut Ashlar stonework. What is interesting here is use of a straightedge to produce crisp 90° angles and sharp straight ribbons. Also, the work done here is not a crisp bead as in other examples but more of a true flat ribbon, which is more akin to tuckpointing associated with brickwork. 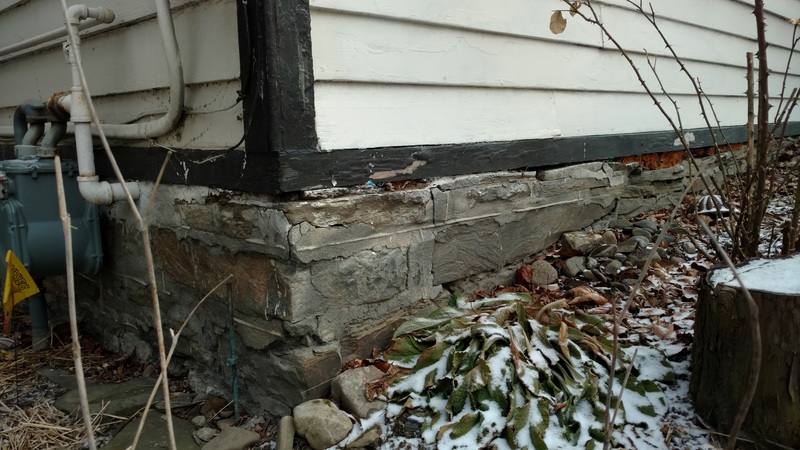 With this level of decay only a small portion of the original article is left behind and is clearly in need of a repointing campaign, and should be finished in a true tuckpointed finish.